Arizona , also known as the Grand Canyon State, is located in the American Southwest. Admitted as the 48th State of the Union in 1912, Arizona is home to the Grand Canyon as well as a variety of terrain, climates and cultures. To the west is California and Nevada, to the north is Utah, to the east is New Mexico, to the northeast is Colorado, and to the south is the Mexican state of Sonora. It is one of the Four Corners states. High desert lands, Wild West history galore and small towns near the border. The Fourteenth Biggest metropolitan area in the United States has artsy urban communities, ritzy resorts, the country's largest university and resulting college town, beautiful desert wilderness on the outskirts and miles upon miles of suburban sprawl. Including Grand Canyon and the "Arizona Strip." The Navajo Nation and numerous beautiful deserts and forests populate the region. The corridor from Tucson to the biggest port of entry into Arizona of Nogales has some beautiful high desert, interesting cities and sparse wilderness. The southwestern corner of Arizona is arid (low desert) yet fed by the lush Colorado River Valley. Yuma is the largest town and has its roots as an old western city with a rich history. Inbetween Yuma and Ajo is one of the most remote and beautiful parts of the Sonoran Desert. Flagstaff - Home of the Northern Arizona University Lumberjacks, Flagstaff is the gateway to the Northern reaches of the state with most people headed to the Grand Canyon's South Rim passing through Flagstaff. Mesa - The third largest city in the state of Arizona and offers a limitless array of activities for both the business and leisure traveler. Phoenix- The capital of Arizona has a vibrant downtown, active Latino communities in South Phoenix, artsy and young Roosevelt Street and the upscale Biltmore area. Prescott - Home to Frontier Days, The World's Oldest Rodeo (1888) and the downtown historical area known as Whiskey Row, a notorious red-light district up until 1956. Sedona - Gorgeous red rock canyons meet Oak Creek in what is considered one of the most beautiful areas of Arizona. Family and romantic getaways await those into hiking, biking, golfing, jeep tours, fine & fun dinning, art, shopping, wonderful spas mixed with a generous smattering of New Agers. Scottsdale - If golfing, shopping and the spa lifestyle is what you're into you'll be right at home in Scottsdale. Tempe - Home to the largest university in the United States, Tempe knows how to party and is bursting with youthful energy. Tucson - Culinary delights and beautiful mountains occupy Arizona's "second city" of Tucson. Nicknamed "The Old Pueblo" & "Baja Arizona"
Winslow - Pass through, look at the billboard and listen to the Eagles. That is basically it. Other cities are listed in their regions. Arizona covers 113,909 square miles, with about 350 square miles of water surface including Lake Havasu, Lake Powell, Lake Mead and the Colorado River. The state consists of three primary topographical features: a high plateau in the northeast of the state, averaging between 5,000 and 7,000 feet in elevation; a mountainous region which runs from the southeast to the northwest with peak elevations between 9,000 and 12,000 feet; and low mountain ranges and desert valleys in the southwestern of the state. The state is defined by the Grand Canyon in the north, the Mogollon (pronounced MUG-ee-own) Rim in the central mountainous region and the Sonoran Desert to the south. Scattered among these regions, features such as the red rocks of Sedona, the tall, wind-swept towers of Monument Valley and the saguaro-filled desert valleys around Phoenix and Tucson add depth and character to the landscape of Arizona. Another prominent feature of the Arizona landscape, a Ponderosa Pine forest stretches across the state from the White Mountain region around Greer and Alpine across the Mogollon Rim to the San Francisco Peaks north of Flagstaff. This strip of pine also extends beyond the Grand Canyon onto the Kaibab Plateau and into Southern Utah. Humphreys Peak, part of the San Francisco Peaks, is the highest point in Arizona with an elevation of 12,611 feet. Baldy Peak, located in the White Mountains, is the second highest point with an elevation of 11,490 feet. In the southwest of the state, the Sonoran Desert stretches out of Mexico and into Arizona with elevations as low as about 100 feet above sea level in the Lower Colorado River Valley. One of the Seven Natural Wonders of the World, the Grand Canyon dominates the Northern Arizona landscape. Stretching 277 miles across the high plateaus and plunging up to 6,000 feet into the arid plateau, the canyon was shaped and carved by the constant motion of the Colorado River. The Grand Canyon features three or four eras of geological time as well several layers of fossil records, several variety rock types, numerous caves and several major ecosystems. When visiting Arizona pack accordingly depending on the time of year and where you are traveling. Throughout the state dress is usually casual and comfortable, especially during the summer months. Very few restaurants require jackets and ties, however if you are planning on attending a cultural event or dining at a finer restaurant, consider bringing business casual attire as well. During the summer, shorts and sandals are standard wear during the day. You can wear a light sweater or jacket during the evenings at higher elevations. In the cooler months, temperatures can differ greatly from day to night, so consider bringing a sweater or jacket if traveling in the desert areas. At higher elevations in the north of the state, a winter jacket is recommended. Hats, sunglasses and sunscreen should be used year-round. A primary reason for travelers to visit to Arizona, specifically in the low desert regions around Phoenix and Tucson, is the state's mild climate during the fall, winter and spring. The warm weather and low precipitation provide travelers with an enjoyable climate for numerous outdoor activities such as hiking, biking, golf and sightseeing. At higher elevations during the winter, snowfall allows visitors to enjoy winter sports such as cross-country skiing. During the summer months, temperatures in the low desert regions can reach well above 100 degrees F, however the climate at higher elevations, as in Flagstaff, stays mild and allows for enjoyable outdoor activities as well as a break from the summer heat. High temperatures near or above 100-110 degrees F are common throughout the summer months at the lower elevations. During the winter, cold fronts can bring temperatures well below zero in the higher areas of central and northern Arizona, with lows averaging between 15 and 20 degrees F.
During drier portions of the year (traditionally the winter months), temperatures can differ greatly from day to night, sometimes as much as 40 to 50 degrees F. In the low desert valleys during the winter, temperatures during the day could average 70 degrees F, with night temperatures dropping to around 40 degrees F. During the summer, the central portion of the state along with the lower elevations can can experience temperature changes up to 30-40 degrees F from day to night. Rainfall in Arizona is primarily determined by season and elevation. In the mountainous region, that runs from the southeast to the northwest, rainfall amounts will average between 25 and 30 inches (including melted snow) annually, while the low-lying desert region averages only three or four inches annually. The high plateau region in the northeast of the state averages 10 inches of rainfall annually. During winter months, November through March, storms occur regularly at the higher elevations in central and northern Arizona and can produce heavy snowfall. Summer months, particularly early July through mid-September, bring the monsoon season to the desert region. Monsoons are strong thunderstorms, typically lasting a short time in certain area, that produce powerful winds and brief periods of blowing dust prior to the storm's arrival. Almost all of these storms occur roughly between mid-afternoon and the middle of the night. The average number of days with measurable rainfall per year ranges from around 70 in the northern part of the state to 15 in the desert regions. The air is usually dry and clear, with low relative humidity and a high percentage of sunshine. April, May and June usually produce the most clear days, while July and August (in lower elevations), as well as December, January and February (in higher elevations) have the cloudiest weather due to thunderstorms. Humidity, is low in comparison to other states, however it is typically higher during the monsoon season. Despite the common perception of Arizona as a warm state, snowfall does occur annually in high altitude areas such as Flagstaff. January 41.2F/5.1C 65.9F/18.8C 0.6" January 16F/-8.8C 43F/6.1C 2.18"
February 44.7F/7C 70.7F/21.5C 0.7" February 19F/-7.2C 46F/7.8C 2.56"
March 48.8F/9.3C 75.5F/24.2C 0.9" March 23F/-5C 50F/10C 2.63"
April 55.3F/12.9C 84.5F/29.2C 0.22" April 27F/-2.8C 58F/14.4C 1.29"
May 63.9F/17.7C 93.6F/34.2C 0.1" May 34F/1.1C 68F/20C 0.8"
June 72.9F/22.7C 103.5F/39.7C 0.1" June 41F/5C 79F/26.1C 0.43"
July 81.0F/27.2C 105.9F/41.1C 0.9" July 50F/10C 82F/27.8C 2.4"
August 79.2F/26.2C 103.7F/39.8C 1.0" August 49F/9.4C 80F/26.7C 2.89"
September 72.8F/22.6C 98.3F/36.8C 0.86" September 42F/9.4C 74F/23.3C 2.12"
October 60.8F/16C 88.1F/31.2C 0.7" October 31F/-0.5C 63F/17.2C 1.93"
November 48.9F/9.4C 74.9F/23.8C 0.7" November 22F/-5.5C 51F/10.6C 1.86"
December 41.8F/5.4C 66.2F/19C 1.0" December 17F/-8.3C 44F/6.6C 1.83"
Arizona is home to 22 Native American Tribes that contribute to the history, culture and economy of the state. While most tribes welcome visitors to experience their proud history and culture, each tribe does have its own guidelines for visitors. In addition, the 22 reservations operate under their own governmental structure. Tribal laws should be viewed in the same manner as U.S. laws and regulations. Before visiting a tribe, you should consult or contact the individual tribe for additional visitor information. Each reservation operates under its own government and its own rules for visitors. Photography and painting may not be allowed. Check with the individual tribe before taking photographs. Dances are typically part of religious ceremonies. Think of these events as you would if you were visiting a holy site, such as a church. Also, be mindful that applause may not be welcome after a dance. Do not climb walls or structures. Sacred areas and graveyards are not usually open to visitors. Reservations and villages should be treated with respect. While most reservations are open to visitors, individual homes are private and should be entered only by invitation. Some arts and crafts sold around reservations may not be authentic. Consult the Indian Arts and Crafts Association for more information about purchasing authentic Native American arts and crafts. Arizona is always on Mountain Standard Time and does not observe daylight saving time, except for the Navajo Nation. This means that during the summer months, Arizona is a hour behind the rest of the Mountain Time Zone (or equivalent to the Pacific Time Zone). During the winter months Arizona has the same time as the rest of the Mountain Time Zone. An easy way to remember this rule is: Colorado in wintertime, California in summertime. It is one of two states that does not observe daylight time, the other being Hawaii. As with all states in the U.S., the primary spoken language in Arizona is English. However, due to the state's history and its proximity to Mexico, Arizona is home to a large population of Mexican-Americans as well as populations from several other Hispanic countries who typically speak the Spanish language (with some Hispanic cultures using a country-specific dialect) in addition to English. Most of the 22 Native American Tribes also have their own distinct language, however it is usually spoken between tribal members. Generally, the peak season in the desert areas (southern Arizona) lasts from January through March with the next most popular season is from April to May and September through December and the season when visitors can find the greatest values is June through August. Peak and value seasons in the mountainous regions (northern Arizona) are the opposite of the desert areas. Generally, peak season is from June through August, shoulder season is April to May and September through December, and value season is January through March. Peak season in some mid-climate areas of the state, such as Sedona, is from March to May and September through October, with shoulder season from January to February. Arizona's main entry point by air is Phoenix Sky Harbor International Airport  (IATA: PHX, ICAO: KPHX). Located between downtown Phoenix and Tempe, Sky Harbor is served by most major airlines and provides non-stop service to over 100 cities worldwide. Airport shuttles service to/from PHX is available via SKOOT  with discounted shared ride fares within a 30 mile radius from the airport. The Tucson International Airport  (IATA: TUS, ICAO: KTUS), located south of downtown Tucson, is Arizona's second busiest airport. Served by several major airlines, TIA current provides non-stop service to 18 cities. In addition to Sky Harbor and TIA, several regional airports are located throughout Arizona including Flagstaff Pulliam Airport  (IATA: FLG, ICAO: KFLG) in Flagstaff, Lake Havasu City Airport in Lake Havasu City,Laughlin/Bullhead International Airport  (IATA: IFP, ICAO: KIFP, FAA LID: IFP), in Bullhead City and Yuma International Airport  (IATA: YUM, ICAO: KYUM) in Yuma. All parts of Arizona are accessible by federal or state highways as well as 22 'Ports of Entry' from surrounding states and Sonora, Mexico. The speed limit on most interstate freeways is 75 miles per hour, however this typically drops to 65 or 55 miles per hour near metropolitan areas. The speed limit on most state highways and U.S. routes in rural Arizona is 65 miles per hour. Arizona law does require that each front-seat occupant wear a seat belt in a car is designed to carry ten or fewer passengers (i.e. not a bus). In addition, children under the age of five must be properly restrained as well. Interstate 10 (I-10) runs east to west across southern Arizona and connects travelers with the major cities of Tucson and Phoenix. I-10 originates out of the east from Las Cruces, New Mexico and out of the west, from Palm Springs, California and Los Angeles. I-10 is a major interstate and does carry a large amount of car and truck traffic. During the week, portions of I-10 can experience very heavy traffic, usually around the Tucson and Phoenix metropolitan areas. Interstate 17 (I-17) runs north and south, connecting I-10 in Phoenix at it southern margin and I-40 in Flagstaff at it's northern margin. The northern drive from Phoenix to Flagstaff (through tortuous but BEAUTIFUL terrain) is the fastest route between the two cities. Please note (as stated below) that I-40, and thus northern Arizona, is positioned above the Mollogon Rim and is affected by heavy snowfall during winter months, which can potentially last until late May. Interstate 8 (I-8) runs east to west, running from I-10 to Yuma. I-8 splits from I-10 south of Phoenix and provides the quickest access to Yuma as well as San Diego, California. However, in the other direction, it does not go to Phoenix directly. At Gila Bend, Hwy 85 connects I-8 with I-10, for travel to the west side of Phoenix and downtown (or Phoenix to San Diego). For the eastern suburbs, I-8 merges with I-10, and it's possible to reverse direction going from I-8 east to I-10 west (exit #178B) or vice versa (I-10 exit #199). Despite the signs, I-10 goes mostly north-south east of Phoenix, and backtracking is very minimal. Interstate 40 (I-40) runs east to west across northern Arizona and connects travelers with the cities of Flagstaff, Williams and Kingman. I-40 comes into Arizona from east after passing through Albuquerque, New Mexico and from the west after passing through Barstow and Needles, California. I-40 is positioned above the Mollogon Rim and is affected by heavy snowfall during winter months. Interstate 19 (I-19) runs south to north in south central Arizona and provides access from Tucson to Nogales as well as entry into Sonora, Mexico. I-19 splits from I-10 just south of Tucson. Because I-19 is a major route to and from Mexico, border patrol checkpoints are common along the interstate, however these checkpoints typically do not take long to pass through. The border crossing at Nogales can be a busy entry and exit point, be patient while waiting to cross the border and have proper documentation ready to present. See 'Stay safe' for additional information. U.S. 93 runs southeast to northwest across northwest Arizona and connects travelers from Las Vegas to I-40 at Kingman. U.S. 93 is the route that the majority of local residents and tourists use to travel to and from Las Vegas and can become very busy on most weekends. On a side note, U.S. 93 also runs across the Hoover Dam on the Arizona / Nevada border. U.S. 60 runs (in a general) east to west across central Arizona, entering the state just south of I-40 from New Mexico. U.S. 60 runs through the White Mountains and the towns of Eagar and Springerville on it's way to Globe and eventually, Phoenix. U.S. 160 runs northeast to southwest across northern Arizona entering the state from Colorado and New Mexico near the Four Corners and ending by joining with U.S. 89 near Tuba City. U.S. 89 runs north to south through northern Arizona and connects travelers from Utah with Page and Flagstaff. In addition, U.S. 89 is the main route for travelers to access the South Rim, North Rim (via Alt-U.S. 89) and the east entrance of the Grand Canyon. Alt-U.S. 89 runs through northern Arizona, starting near Fredonia, Arizona and Kanab, Utah, and connects to U.S. 89 south of Page. Alt-U.S. 89 is the main route to access to the North Rim of the Grand Canyon. Bus service to Arizona is available via Greyhound with several stops available including Flagstaff, Glendale, Phoenix, Tucson and Yuma. In addition several companies catering to the large Mexican population in Arizona such as Autobuses Americanos and Tufesa run buses from both Phoenix and Tucson into Mexico going as far south as Mazatlan and Guadalajara. The Southwest Chief  runs from Chicago to Los Angeles with stops in Winslow, Flagstaff, Williams and Kingman. For much of its route, the Southwest Chief follows historic Route 66, and offers an interesting perspective of the historic road and its surroundings. A Thruway bus continues from Kingman to Las Vegas and from the Williams Junction stop to Williams. The Sunset Limited  runs from New Orleans to Los Angeles with stops in Benson, Tucson, Maricopa and Yuma. Nearest stop to Phoenix is in Maricopa where passenger arrange their own transportation up to Phoenix (without car). The Texas Eagle  runs the same route as the Sunset Limited from Los Angeles to San Antonio. (Westbound trains joins in San Antonio). Route splits in San Antonio where the Texas Eagles goes north towards Chicago while Sunset Limited continues east to New Orleans. Same stops as the Sunset Limited in Arizona. As with most western states, the easiest way to get around Arizona is via car. The federal and state highway system offers travelers easy access around Arizona whether you are driving your personal car or a rental car. While most major cities in Arizona do offer public transportation, including Greater Phoenix, Tucson, Flagstaff, and Sedona, state-wide public transportation is very limited. Nearly all major attractions and tourist destinations in Arizona are accessible via car. Interstate 17 (I-17) runs south to north across central Arizona and connects travelers with the major cities of Phoenix and Flagstaff. I-17 is the main route north to Sedona, Flagstaff and the Grand Canyon from Phoenix. It provides easy access to Sedona via AZ 179 as well as Prescott, Jerome and Montezuma Castle National Monument. Because I-17 is the major route north, it does a large amount of car and truck traffic, especially during busy weekends and holidays. During the week, portions of I-17 can experience very heavy traffic due to commuters. The Apache Trail (Hwy. 88) is a 42-mile long scenic drive through the Sonoran Desert. It goes out to Theodore Roosevelt Lake and the mining town of Globe. Along the way are ample views of yuccas, saguaros and desert lakes. Renting a car in Arizona is very similar to any other state. Rental cars are available at most major airports, especially the main entry points of Phoenix Sky Harbor International Airport and Tucson International Airport. Bus service to Arizona is available via Greyhound  with several stops available including Flagstaff, Glendale, Phoenix, Tucson and Yuma. Arizona is an outdoor enthusiast's playground, with great hiking, backpacking hunting, fishing, and rock climbing within an hour's drive of all of the major city centers. Arizona is known for its great Southwestern style food, including everything from Mexican fusion dishes to street-side burrito stands. The chimichanga, a deep fried burrito was first created here. Cactus (nopales in Spanish) is also edible and can be eaten fried or in salads. The legal drinking/purchasing age of alcoholic beverages is 21. Remember, alcohol is prohibited in areas that are under the jurisdiction of the Navajo Nation. So don't bring alcohol on the Native American reservation, unless you want trouble from the Navajo Police. Bottled Water and Lemonade are popular drinks. Like many western states, Arizona has had cases of hantaviral pulmonary syndrome, 62 confirmed cases in the state since 1993. Realistically, however, hantavirus is of very little concern to the traveler; but sensible precautions should be applied. Do NOT venture in a wild animal's den or handle any dead animals; particularly rodents, as rodents seem to be the primary vector of the illness. There is no cure for the disease, treatment mainly consists of supportive therapies. The main defense against the virus is prevention. For more information on prevention and transmission, visit the Centers for Disease Control and Prevention  website on hantaviruses. The Arizona DPS controls and have jurisdiction in the entire state. They do traffic division but can also help out local law enforcement agencies. The Arizona DPS usually wears a tan uniform with a rangers hat on top. Due to Arizona's proximity to the International Boundary with Mexico, visitors should be cautious while in areas near the border. Report any suspicious behavior to the U.S. Border Patrol or law enforcement. Residents of Arizona are allowed to conceal carry firearms after a thorough out extensive background check and training. Be aware it is illegal to bring any weapons into the country of Mexico. Bringing guns and weapons into Mexico will result in fines, detained by Mexican authority and a trip straight to a Mexican Jail. A large portion of Arizona's land area consists of extensive desert landscapes, many of which are very remote and can easily become disorienting to a tourist who is unfamiliar with these locations. It is not at all uncommon for temperatures in the Arizona desert to reach 115-120 degrees Fahrenheit during the summer months, which have the potential to impose deadly consequences to anyone who should become lost or stranded in these areas. If are planning on traveling or hiking into these locations, follow desert survival guidelines. Be sure to take plenty of water (at least one gallon per person, per day), sunscreen and wear light clothing. Let someone know where you are going and when you expect to get return. Also, it is best to hike during the earlier part of the day, as thunderstorms tend to develop suddenly during the afternoon. In the event you encounter inclement weather conditions, seek high ground immediately! Thunderstorms can cause flash flooding in canyons and other low laying areas. For information on road conditions or traffic information dial *511 from any phone. Road conditions and traffic information is also available online from the Arizona Department of Transportation or the Federal Highway Administration. Be aware that Arizona Highway Patrol can and do close I-40, I-17 and other major roads due to high winds or severe snow storms. During extremely severe weather, it may not be possible to send traffic back to a town, so travelers should plan accordingly. Turn on your headlights and slow to an appropriate speed. If you can safely avoid it, do not enter the dust storm. If you need to pull off the road, get as far to the right as possible. Turn off the car, set the parking brake and keep your foot off the brake pedal – other drivers may think you’re a car in motion. Pay attention to hazard signs and roadblocks. If you see a sign that says "Do Not Cross When Flooded", take it seriously and find another way. Section 28-910 of the Arizona Revised Statutes, commonly known as the "Stupid Motorist Law" , states that any motorist who drives around barricades into a flooded stretch of roadway may be charged for the cost of his or her rescue. Don’t cross rain-swollen washes. You could get caught in a flash flood. That guy out there who seems to be only ankle-deep in water may be standing on the roof of his pickup truck. Most of these summer monsoon rain storms are accompanied by lightning. Take proper precautions. In the event of an emergency, dial 911. For non-emergency police or fire assistance, contact the local police or fire department directly. Summer temperatures in some areas of Arizona nearly can surpass 100 F (38 C) and visitors should take extra precautions while visiting the state. In Phoenix, record temperatures of 118 F and 116 F (48 & 47C) have been approached with greater regularity in recent years. Frequent hydration is extremely important. Rest frequently in shady areas so that the body's temperature has a chance to recover. If unaccustomed to working or exercising in a hot environment, gradually increase the pace and limit exercise or work time. Wear lightweight, loose-fitting clothing; sunglasses to protect the eyes; and a wide-brimmed hat to provide shade and keep the head cool. Take special precaution with infants and young children by dressing them in loose, cool clothing and shading their heads and faces with hats or an umbrella. Protect their feet with shoes. Never leave infants, children or pets inside a parked vehicle. Increase fluid intake, regardless of activity level. Don't wait until thirsty to drink fluids; drink more liquid than one's thirst indicates. Avoid "heat hangover." Continue to drink fluids even after strenuous activity. This will enable the body to maintain optimum hydration, and help prevent the after effects of heat exposure such as headaches and fatigue. Avoid beverages containing alcohol, caffeine or large amounts of sugar as they dehydrate the body. These are very numerous in Arizona, and many remain unmarked. Many mine shafts are as deep as a skyscraper is tall, creating an extremely dangerous hazard. Do not travel along unknown trails and primitive dirt roads by ATV, motorcycle, horseback, etc. or deviate (even by a few feet) from existing well-used ones. For more information, including safety tips, visit the Arizona State Mine Inspector website. Although Arizona allows the purchasing and use of consumer fireworks, Arizona is currently the only state to only allow the purchase and possession of only Novelty fireworks. So if you wish to use more explosive fireworks or sparklers, it's best to go to a neighboring state to purchase and use them. Fortunately, all neighboring states allows the possession and purchase of more explosive fireworks and sparklers. Do not bring your purchased non-legal fireworks back into Arizona, that qualifies as smuggling as you(the consumer) is in possession of fireworks. And punishments for smuggling fireworks in Indianalead to serious jail time. Lighting them in the countryside isn't recomended as you'll never know if there's someone nearby watching. This also goes for anyone who is just driving through the state with a vehicle full of non-legal fireworks. Snakes are very common in the state of Arizona including dry rural areas including deserts. Some of the snakes that live in Arizona are venomous snakes. Never try to pick up any snakes if you don't know the species. Harassing or provoking a snake is illegal and dangerous. Rattlesnakes are common in the state of Arizona in rural areas. All rattlesnakes are considered extremely venomous. A coral snake also lives in the state of Arizona. Pit vipers also live in Arizona. If you are bitten by a snake call emergency services and seek emergency attention. A good way to determine if a snake is venomous is to see if they have pits between the snake eyes and nostrils. If they have no pits then the snake is safe. If they have pits then watch out, the snake is poisonous. Thick snakes is also a concern as most non venomous snakes are thin. Residents of Arizona are allowed to carry a conceal firearm after extensive training and a background check. Bringing guns or ammunition into the country of Mexico is illegal. Doing so will result in being detained by the Mexican Authorities and going to jail. Many Arizonans especially in Greater Phoenix are socially and politically conservative and have strong Catholic or Christian beliefs, so be careful when discussing religion and politics. As with the rest of the country sensitive and divided topics are race, religion, politics and gay rights. 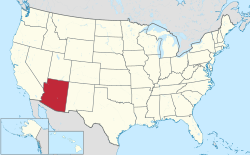 Arizona's geographic location and the interstate system allow easy access to California, Nevada, Utah, New Mexico, Colorado (via Utah or New Mexico) and the state of Sonora in Mexico. One Warning; The legal drinking age in Sonora is 18, and many that are not yet 21 travel to the state to indulge in drinking. Those living close to the border with Mexico also travel there to indulge in prostitution, since it's legal in the state. While those in Northern Arizona travel to Nevada to indulge in prostitution, since it's legal in the state. California - America's most populous state borders Arizona to the west, offering easy access to destinations such as Los Angeles, Palm Springs, San Diego and Joshua Tree National Park. Nevada - Destinations that are easy day trips from Arizona's northwestern border include Henderson, Las Vegas and Lake Mead National Recreation Area. Utah - Sharing similar climate and terrain, northern Arizona is close to St. George, Capitol Reef National Park, Canyonlands National Park and Glen Canyon National Recreation Area. Colorado - Located to Arizona's northeast, the towns of Cortez and Durango are good day-trip options, as is Canyon of the Ancients National Monument. New Mexico - The state's eastern neighbor puts the cities of Albuquerque and Santa Fe within easy driving distance for visitors. Sonora - For those willing to cross the border to the south into Mexico the towns of Hermosillo, Nogales and Puerto Peñasco (Rocky Point) make for interesting visits. Four Corners Monument is where Arizona, Colorado, New Mexico, and Utah meet at right angles. Take US Hwy 89 east of the Grand Canyon, and turn onto US Hwy 160 going to New Mexico. Just across the state boundary, turn left at New Mexico Hwy 597. About 225 miles (360 km) from either Flagstaff or Grand Canyon Village. This page was last edited on 18 October 2018, at 15:01.